Daily Illuminator: Conan Versus The Snow Devil . . . Place Your Bets! May 9, 2012: Conan Versus The Snow Devil . . . Place Your Bets! Always in search of adventure, the mighty Conan boldly journeys to Snow Devil Pass -- the final resting place of many who dared its dangers and failed. Will he triumph against the cold, the beastmen, and the other unspeakable horrors that lie beyond? Newly released to e23, GURPS Classic: Conan the Wyrmslayer puts you in the role of the renowned Cimmerian -- or a hero of your own creation -- as he braves the perils of Snow Devil Pass. And if you don't succeed the first time, fear not! This solo adventure can be played many times without reliving the same tale. In addition to the maps and stats for the threats you'll face, it includes GURPS details for Conan as he was at age 23. So don your furs and your fearlessness. 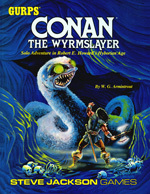 You'll need both if you plan to overcome the icy death that awaits in GURPS Classic: Conan the Wyrmslayer!